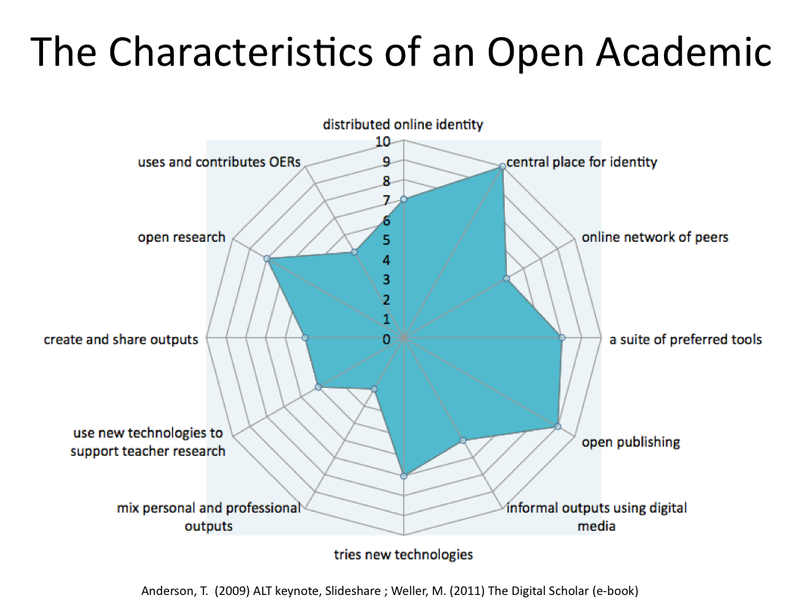 Open Academic Practice – How open are you? This was a question that I asked FSLT13 participants this week in a synchronous online session that I was invited to run. 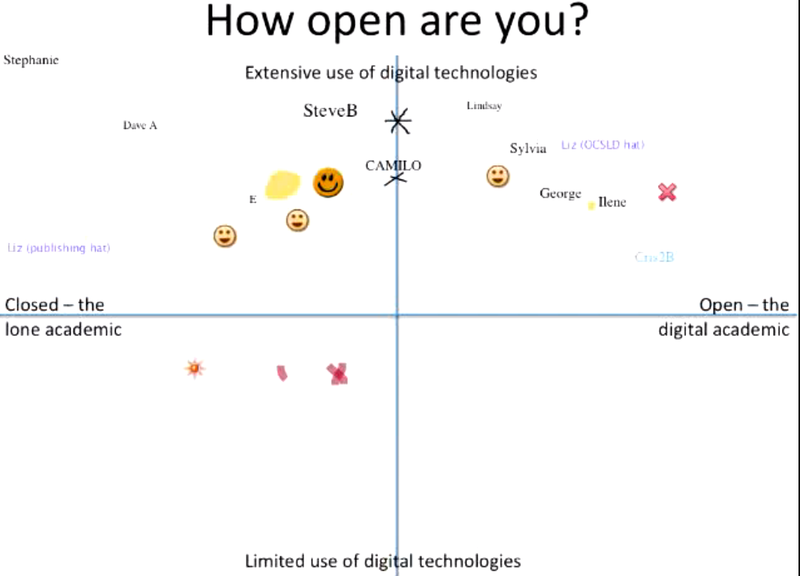 I suggested that we place ourselves on this grid, according to whether we consider ourselves a lone academic or an open scholar and whether we make limited use of digital technologies or extensive use of them. This was the response. Given that FSLT13 is principally for people new to learning and teaching in Higher Education, but also for anyone who has an interest in learning and teaching in HE, the outcome of this activity is not really surprising. Whilst the majority of people in the session felt they are making good use of digital technologies, not everyone feels they are working as open academics, and as one participant pointed out the notion of ‘openness’ can be context dependent. The invitation to run this live session was good for me. It forced me to consider how open I am. I decided to try and depict this graphically by using characteristics which have been discussed by Terry Anderson and Martin Weller (see references at the end of this post), scoring myself out of 10 for each characteristic and generating a radar graph. This was the result. It is fairly obvious from this that there is room for more openness in my academic practice, but that would mean increased contribution of OERs and shared outputs, increasing my online network and mixing personal and professional outputs. To be honest, I am hesitant to do any of these things. I can just about keep up with the online network I have, my outputs would have to be of significantly higher quality for me to feel confident in pushing them out there, and there’s no way I want to share aspects of my personal life with people I don’t know. So that leaves me with being more adventurous with new technologies, which I could/should do, and maybe that would increase my confidence with sharing outputs and thus increase my online network. Given how many years’ experience I have had of teaching and learning on and offline, it is easy to see how becoming an open academic can be daunting. I have in the past discussed the ‘tyranny’ of openness and the fact that regarding openness as some sort of moral imperative can be unhelpful. In other words openness can be seen as an opportunity rather than a threat. But ultimately openness is an individual dimension as Carmen Tschofen and I discussed in our paper – Connectivism and Dimensions of Individual experience (see reference below). It took me a while to relax (I still find it difficult to talk to an invisible audience), but once I got going, I enjoyed it. However, despite all my preparation and determination to be sufficiently organised to be able to follow the chat at the same time as speaking, I still didn’t manage it. So apologies to those whose questions went unanswered. The rewards of open practice come in reciprocity, alternative perspectives and opportunities for dialogue. Thanks to FSLT13 participants and team for this opportunity. Focus on your own learning experiences, how do you learn best? How have your own learning experiences influenced how you teach? These are the questions asked in the first week of the FSLT13 course (not yet a MOOC. According to Stephen Downes you need more than 150 active participants – Dunbar’s number – to be a MOOC, but that begs the question of what we mean by active). …. I qualified as a teacher in 1969 – rather a long time ago. Last year for FSLT12 I was a tutor on the course and didn’t really have time to think about this question, but I was impressed by all the participants’ posts and in particular the autobiographical response made in a series of blog posts by Fred Garnett about how and why he came to be the teacher that he is. (See Stephen Brookfield’s work on becoming a critically reflective teacher for further information about reflective writing using an autobiographical lens). Reflecting on this, I know that condensing more than 40 years of experience into one post is nigh on impossible, but as it so happens, I have recently watched a TED talk by Ken Robinson – How to Escape Education’s Death Valley. This talk is about school education. I spent quite a few years teaching in schools and teacher training (teaching how to teach in schools) so a lot of it resonates. In fact I think he’s spot on. Through the years I have taught all ages from the youngest of children to adults at Masters level. Years ago a wonderful Head teacher, to whom I am eternally grateful, insisted that I teach the youngest children (4/5 year olds) telling me that if I could teach these children (kindergarten), then I could teach anyone – and I have found that there is a lot of truth in this. Ken Robinson in his talk says that ‘the role of a teacher is to facilitate learning – that’s it’. In recent years I have thought a lot about the role of the teacher and despite my many years in the teaching profession, as the years go by I think of myself less and less as a ‘teacher’ in the traditional sense of the word. This thinking started a few years after I qualified as a teacher with the sudden realisation/revelation that teaching isn’t about me, but about the learners. When we are new to teaching all we can think about is ourselves and our ‘performance’ and unfortunately many teaching situations and practices encourage performance (we are observed, assessed, inspected, judged). So we end up with a focus on questions such as Have we planned the lesson effectively? Do we know the subject? Will we engage the learners? Will we be able to explain the subject? All a focus on me as the teacher instead of on the learner. As time went on in my teaching career I began to realise that I was the least important person in the process and that my focus should be on the learners – what were they learning, were their learning needs being met, did I know who they were? But having been a teacher trainer I know that you have to go through the first step, i.e. who am I as a teacher, to get to the second step, who are the learners. My current approach to ‘teaching’, if you can call it that, is a strong belief in learner autonomy and negotiated meaning and a belief that learning is emergent and cannot be controlled by the teacher whether or not it is prescribed. Recent research into what kinds of learning environments promote emergent learning and how these environments are experienced, confirm time and again that learner experience is unique to the individual (see this wiki for examples), which really shouldn’t come as a surprise, but which makes me wonder about the logic of the teacher planning learning objectives. Stephen Downes has said that to teach is to ‘model and demonstrate’ and to learn is to ‘practise and reflect” – but as Cris Crissman has pointed out in a comment on my last post – a teacher is also a learner, so also ‘practises and reflects’. To ‘model and demonstrate’ probably needs unpicking. Anderson et al. in their Community of Inquiry model write about ‘teaching presence’ and Stephen Brookfield in the podcast posted on the FSLT13 Moodle site, make it clear that whilst a teacher may be learning alongside learners, there is still a need for intervention – but the manner of this intervention has to be carefully thought through, particularly with regard to power relationships. At what point does intervention become interference? There is a delicate balance here to be understood and worked with. I think I learn best when I have a good sounding board and safety net (teacher), but also when I feel empowered and in control, so this is how I try to teach. Catherine Cronin articulated this very well in her keynote this morning to the ICT in Education Conference in Ireland in terms of student voice . Hopefully a recording of the keynote will become available soon. The Ist Hotseat was well worth attending – so I’m looking forward to this one. This year’s second Hot Seat discussion in the area of networked learning runs from November 20-25. Terry Anderson & Jon Dron will facilitate a discussion on Nets, sets and groups. They start the week on Sunday 20th with an elluminate synchronous session at 1:00pm MDT. Check out your time zone here: http://bit.ly/uwgrR6. You can enter the elluminate room here: http://tinyurl.com/3rahrud. This week-long online discussion is freely open to everybody who wishes to participate, so come and join us as we begin the countdown to #nlc2012! I have been thinking a lot about Terry Anderson’s post and the reaction it provoked in the changemooc sychronous session and in responses to the post (I think this is the right recording of the sychronous session). In this post Terry ‘laid bare’ that he felt alienated in the session on Rhizomatic Learning led by Dave Cormier, supported by Stephen Downes and George Siemens. In his post Terry was at pains to say that he respected Dave’s work – also Stephen and George’s work – but that he had felt alienated from the ChangeMOOC synchronous session for a number of reasons, which were both to do with the conversation (chat) in the MOOC session about the ideas being discussed, and with the concept of a MOOC and the technologies involved. Dave, Stephen and George’s response appeared to me to be quite defensive and I wondered why. I have noticed this before when MOOCs or Connectivism are interpreted as being attacked. My own interpretation of Terry’s post was that he was genuinely concerned and somewhat bewildered by his sense of alienation. He was not making a personal attack on Dave, George or Stephen but simply expressing how he felt and, from my perspective, being refreshingly open and thoughtfully critical of some of the ideas being expressed. I don’t want to go into the nitty gritty of what Dave said, or what Terry said or what Stephen and George said. I don’t think that’s the point. My point is that MOOCs and the ideas within them seem to be over sensitive to critical discussion and opposing points of view. In CCK08 we experienced the maliciousness of a genuine ‘troll’. But Terry’s post was not malicious. He seemed genuinely concerned that he didn’t feel part of either the ideas or the social scene (i.e. alienated – which is not a comfortable feeling – even painful). What is the responsibility of the MOOC conveners to ‘newcomers’ or ‘MOOC novices’? How will the MOOC avoid ‘group think’, and in reality welcome and embrace the diversity of ideas that inevitably comes from a diverse network – which may (and hopefully will) include critical discussion of MOOCs. Isn’t this what a MOOC is supposed to be all about?